Thanksgiving is quickly approaching and there’s so much to look forward to: Seeing loved ones, eating yummy food, and (hopefully) getting a little break from work! Another thing that’s always fun for Thanksgiving is getting to dress up for the occasion. 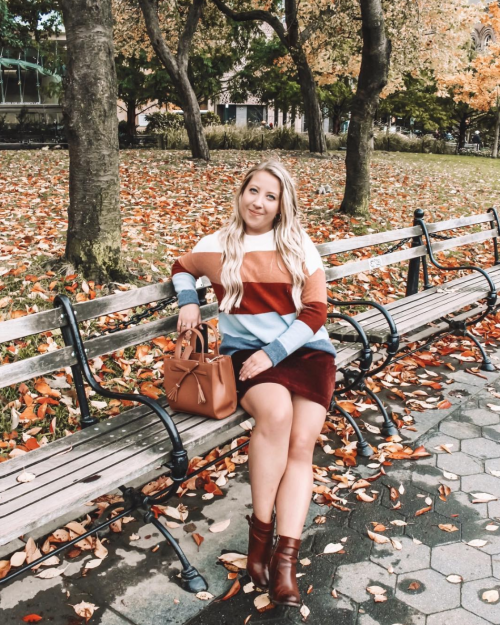 It’s the epitome of fall fashion, and weather your family is the casual football-watching type or the fancier dinner party type, there are amazing options for everyone. My plans this year include seeing family and heading to Ohio for Turkey Day. Something else that I’ll be doing this year is my five year High School reunion….I mean how crazy is that?! I feel like I’ve been out of High School forever, honestly. But, it will be nice (or weird) to see some long-lost friends. I stay in touch with my closest group of girlfriends and one of them is actually getting married this weekend! I’m super excited to celebrate with them back at home before the holidays too. Everyone wants to look festive for the holidays, right? These looks are all Thanksgiving appropriate for however you celebrate. Click on each image to shop, and let me know your Thanksgiving plans! These are such cute looks! I love your sweater! I love the sweater! The colors are so perfect for Fall! I hope you have a great Thanksgiving! I’m so ready to eat! Lol! So many cute outfit ideas! Loving your sweater!! Love your striped dress! Happy almost thanksgiving babe! Loving this dress on you! So cute and perfect for Thanksgiving. I am loving those booties! I am glad that you are seeing your family! I love the sweater you’re wearing! It is so perfect for fall. I still have no idea what I’m going to wear for Thanksgiving! Loving your outfit!! The perfect fall colors! Happy Thanksgiving! Love your picks girls. That striped look is so trendy.